Directors Present: Jim Andrews, Linda Barber, George Borrello, Pierre Chagnon, Ted McCague, Dave Shepherd, and Dave Wesp. Others in Attendance: Erin Brickley – Alliance Executive Director, Randall Perry – Alliance Project Manager. Tory Irgang & June Diethrick – Chautauqua Region Community Foundation. Linda Swanson – Sheldon Foundation. Regis Thompson – Chautauqua Lake Fishing Alliance. Interested citizens: Doug Champ, Craig Butler, Rebecca Haines, Paul Luchsinger, Jack Nord, Phil Strand, Sam Hazen, Doug Ronshein, Caroline Bissell, Bob Moon Sr, Jack & Barbara Sobel, Anthony Hopfinger, and Vince Horrigan. Member Representatives in Attendance: John Jablonski & Ted First– Chautauqua Watershed Conservancy (CWC), Louise Ortman – Town of North Harmony, John Shedd – Chautauqua Institution, Jay Bailey & Marla Connelly – NYS Office of Parks, Recreation and Historic Preservation – Allegany Region, Karen Rine – South & Center Chautauqua Lake Sewer District, Cassie Brower – Chautauqua County Soil & Water Conservation District, Dave McCoy –Chautauqua County, Hugh Butler – Chautauqua County Chamber of Commerce, and Jim Cirbus – Chautauqua Lake Partnership (CLP). Mr. Chagnon called the meeting of the Chautauqua Lake and Watershed Management Alliance (Alliance) to order at 4:30 pm. It was noted for the record that there was a quorum (7 of 7) present. Mr. McCague made a motion to accept the minutes of the 8/9/18 Board Meeting, seconded by Ms. Barber. The motion was approved unanimously. Mr. Chagnon advised that he is proposing a revision to the Alliance Conflict of Interest (CoI) Policy as a result of a recent unprecedented request for copies of the board members CoI statements currently on file. The CoI Policy does not currently indicate whether the statements are considered public information. In doing research, some organizations clearly identify CoI statements as public, some clearly identify them as not public, and many, like the Alliance, do not specify. In the spirit of transparency, Mr. Chagnon recommended updating the policy to state that this information may be viewed publicly upon request. Mr. Chagnon also advised of another slight language change that would require the CoI statements be documented and collected after a director is seated, rather than “prior to initial election” as currently stated. Mr. Chagnon noted that if the board approves these changes to the policy; all directors and staff would execute new CoI statements for our records that will then be publicly available upon request. Mr. Wesp motioned to accept the proposed changes to the Conflict of Interest Policy, seconded by Mr. Shepherd. The motion was approved unanimously. Mr. Chagnon advised that the Science Committee chair, Mr. Spann, was unable to attend today but Mrs. Brower was in attendance to give an update on behalf of the chair. She advised that the committee had last met on 9/11/18 with two primary topics reviewed and discussed. First, Mrs. Brower updated committee members on her recent experience participating in six sigma training at Cummins, with a special thank you to Karey Lawton at Cummins for facilitating this. There is still discussion on how to best utilize this six sigma training as it relates to lake management. The second topic before the committee was a draft presentation and discussion with CWC staff regarding their Alliance granted/funded project to do some baseline tributary sampling titled “Chautauqua Lake Tributary Stream Water Quality Analysis Program”. Ms. Brickley noted that contractually, the project design/final scope of work must be completed utilizing the local partner organizations’ expertise named in CWC’s project proposal which will be reviewed and approved by the Alliance staff and/or board prior to the commencement of in field implementation and to be eligible for grant funds disbursement. Therefore, the Alliance has asked that the Science Committee review, offer input during final project development, and to make a final recommendation to the Alliance board for acceptance of final project design. Mrs. Brower commented that effort is currently ongoing as CWC drafts their final approach to the project. Overview: Several local funders were interested in seeing increased governance capacity at the Alliance as we are experiencing an evolving role in the community. In order to ensure full understanding of their expectations, Mr. Chagnon formed an ad-hoc governance capacity committee comprised of Mr. Shepherd, Ms. Barber and Mr. Horrigan at the 6/14/18 board meeting. Mr. Horrigan reported to the board the following month that their committee had met with funders and key lake and watershed members and in general terms they would like to see more stakeholder input. Then at the 8/9/18 board meeting, the ad-hoc committee draft recommendations were reviewed, entitled “A draft framework for strengthening stakeholder input and governance for the CLWMA (as of August 9, 2018)”. Mr. Horrigan requested feedback on the draft from members by the end of August. Mr. Chagnon expressed that he wished to apologize for the perception that some people formed at the last Alliance meeting that the local foundations are directing the Alliance. This is not the case. Some of the local foundations are members of the Alliance and all have been supportive of the Alliance. The local foundations expressed an opinion that the Alliance should perhaps consider increasing its governance capacity. Thus, Mr. Chagnon formed the ad-hoc committee to learn what this meant and bring recommendations to the board for consideration. The foundations are not dictating how the Alliance governs itself. Mr. Horrigan advised that the ad-hoc committee received feedback on their August draft from five organizations that were considered prior to finalizing their recommendations. Mr. Horrigan then presented the final recommendations (see final report attached to these minutes) and noted that it is his understanding that the intention of the board is to receive this report today but that no action will be taken at this time. Mr. Erlandson commented that he did not see a science committee noted in the recommended changes to the committee structure under the second recommendation. 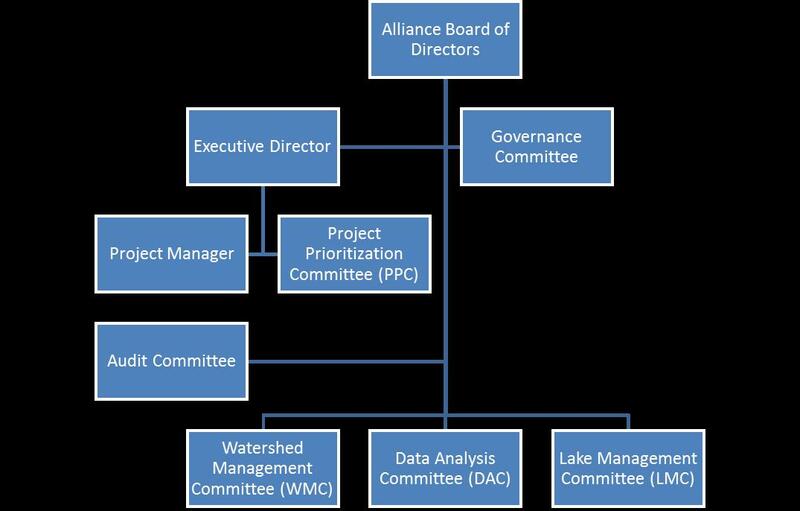 Mr. Horrigan noted that this group would fall primarily under the Data Analysis Committee but we would want to weave science expertise throughout the three new committees: Watershed Management Committee, Data Analysis Committee and Lake Management Committee. Mr. Erlandson asked if there was a projected date to disband the science committee as currently configured. Mr. Chagnon commented that these recommendations from the ad-hoc committee are still under consideration. Mr. Chagnon commented that the seating was rearranged for today’s meeting, on a trial basis, aiming to make the meeting more inclusive and discussion oriented. He noted we will continue this for a time to see how it works but recommendations for improvement are welcome. Mr. Chagnon then proposed revising the current board meeting schedule, alternating the monthly meetings between the current public format (odd numbered months) and work session format (even numbered months) which would include only directors and staff. Mr. Shepherd made a motion to approve the revised meeting schedule, seconded by Mr. Borrello. The motion passed unanimously. Mrs. Irgang asked if there would be board actions during the alternating work sessions and Mr. Chagnon advised there would be. Mr. C. Butler asked if there would still be minutes taken and published for the work sessions as there has been for the public meetings. Mr. Chagnon advised that would still need to be determined but his initial thought is that for transparency, we would continue to produce minutes and make them publicly available for all meetings of the board. At the August board meeting, Mr. Chagnon noted that we had two at-large director openings and four nominees: Jay Bailey from OPRHP – Allegany Region, Hugh Butler from County Chamber of Commerce, Jim Wehrfritz from CLP and Bruce Erickson from CLA. The Governance Committee decided after discussion that some candidates are unknown to some sitting directors and therefore, we will proceed with interviews with each of the four nominees. The goal will be to have recommendations for the top two at next month’s meeting. Update: Mr. Chagnon advised that all four quality candidates were interviewed by the sitting directors prior to today’s meeting. All were asked the same list of interview questions. He also advised that the governance committee was forgoing making recommendations and alternatively the sitting board will vote individually by written ballot. He noted the Mr. Shearer’s vacancy expires 5/2019 and Mr. Spann’s vacancy expires 5/2021. Upon counting of the votes (performed by Mr. Shepherd, board secretary, and double checked by Mr. Perry), Mr. Bruce Erickson received a quorum of votes for the vacancy expiring 5/2021, however there was no quorum on the shorter term vacancy. A re-vote, excluding Mr. Erickson was performed and Mr. Jay Bailey received a quorum to fill the vacancy expiring 5/2019. Ms. Barber asked if the two new directors would be seated now and Mr. Chagnon advised they would need to complete their conflict of interest forms and therefore would be seated at the next meeting. Mr. Chagnon also advised that a new director welcome packet had been collated with the kind assistance of Mr. McCague, and will be shared with both Mr. Erickson and Mr. Bailey prior to the next meeting, as well as courtesy copies shared with current board members. Mr. Champ commented that what is happening in the community as it relates to herbicide use is concerning and wanted to know why the Alliance has been neutral on this topic. He stated that it is important to get the science right and feels the Alliance could have played a larger role in directing this community discussion and ultimately the actions taken as well as giving context on the eutrophication process that plagues this lake regardless of using herbicides or not. But now there are legal challenges resulting in time and money being wasted. Mr. Borrello commented that he agreed that it has been unfortunate series of events with passion on both sides. Therefore, he had commenced preliminary meetings with all involved players in an effort to find common ground. Mr. Borrello then advised that the County was working on coming up with guidance for the responsible use of herbicides that everyone involved could live with and that he would foresee the Alliance executing such guidance. He noted that it is critical to continue to point out that no one action or silver bullet exists as a single solution to lake impairments. Ms. Connelly advised those in attendance that Long Point State Park beach had been closed since the last Alliance meeting due to algal blooms. Mr. McCoy advised that he attended a HABs conference last month at the Finger Lakes Institute at Hobart and William Smith Colleges. He has since reached out to the Finger Lakes Institute on initial collaboration for any lessons learned from each other’s management efforts. He also noted an interesting conversation had with a group from Cornell regarding Honeoye Lake which is similar in nature to the south basin of Chautauqua Lake. It was interesting to note that Honeoye had performed many actions to mitigate HAB but are still experiencing HAB issues. Internal loading and tilting thermocline dynamics paired with wind impacts were being researched. Mr. Borrello motioned to adjourn at 5:30 p.m., seconded by Mr. McCague. The motion was approved unanimously. For the Chautauqua Lake and Watershed Alliance: September 13, 2018. All Board vacancy interim appointments should be voted on at next annual member meeting. Length of term will carry from the original director that created the vacancy whether interim appointment remains the same or members vote in a different person the following May to that vacancy. Director categories of County, Municipalities and At-Large will remain the same as identified in current By-Laws. The At-Large category would be increased by two. A Board member will chair each committee with a member co-chair except for PPC. Recommend executive director and board chair act as co-chairs for PPC. This governance capacity recommendation is submitted for further review and action to be determined by the current Board of Directors.